Beautiful little towns like this one near Wengen, Switzerland sit in the lush valleys of the Alps in grand settings. Though the cable cars are available to carry you up I did hike instead giving me several aerial views of the valley below and majestic scenes like this. Dizzying view, and doubly impressive knowing you hiked to reach it. Breathtaking view of the valley and mountain peaks! Brings back memories when I walked there with my wife and her parents !! 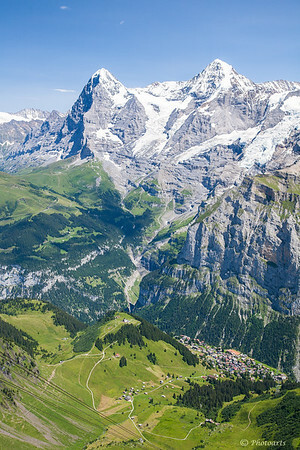 Such a beautiful region, the Berner Oberland ! Wonderful shot !!! Awesome pov and landscape! Kudos to you for hiking up...I'm impressed! This is stunning! I love the comp and being able to see the village.